Return Fire was the most anticipated book in my classroom this year, even more than Raina Telgemeier’s Ghosts. We read the Christina Diaz Gonzalez’s first book, Moving Target, as a class last year and even had a Skype call with the author. We were eager to learn what would happen to Cassie Arroyo and the spear; we weren’t disappointed. 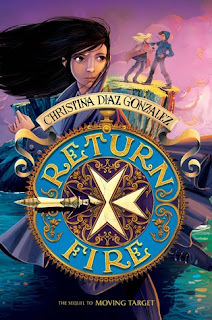 Return Fire offers redemption for some villains, which means that Cassie is more forgiving than I am, or that this is a true middle grade novel where the reader needs to learn about giving second chances. I would not have been so kind as Cassie, which was a good discussion topic with the class. When can someone be forgiven? How do people learn to trust again? The story wraps up fairly neatly in the end, and Gonzalez told us there won’t be any more in the series. I like when an author knows when to end a story, but will also be looking forward to her next book.